We talk about good writing when the written work – be it an essay or an email, a poem or a business letter – expresses a clear point, has substance, is tightly structured, is grammatically and syntactically correct, and last but not least, is interesting. Put in these terms it is clear why writing is often referred to as an Art. Writing effectively is a challenge for many English native speakers. Our prose may have substance but may also lack grammatical correctness; it may be tightly structured but vague in content. You can imagine therefore how much more difficult it must all be for your ESL students, who try to master this Art in a foreign language. A way you can help your TEFL class students is by adopting Process Writing. Process Writing (PW) focuses on the process of creating writing rather than the end result – the written work. Although the five stages are logically sequenced, students can move back and forth among these stages while process writing. Basically, process writing is a technique to help students understand that their written work doesn’t need to be perfect the first time round. They can, and in fact they should, view their writing as a work in progress. Revising and editing, if done constructively and according to an initial plan, should be part of their work and never dismissed as a waste of time. Students, especially when sitting for their written exams, often feel a lot of pressure to deliver a good piece of writing the moment they get their blank piece of paper to fill in. This in turns causes them a lot of anxiety and a general sense of failure, even before they start. By training your students in process writing you can improve their state of mind and general performance. And who knows, you may even discover a few talented writers in your class! Get your students to plan and gather ideas for their piece. Then have them put those ideas in a rough draft. The next stage is to get them to revise and improve their draft. Have them reread their work and share it with a partner or small group; they can then make changes in their writing using the feedback they received from their classmates. Once this is over you move them on to editing their piece. This is the time when students need to concentrate on correcting any grammar or spelling mistakes. Finally students can publish their work, that is, they get others to read it. This can be achieved in a number of ways when the work is in its final form. You might simply have them write out the work as a final copy. Or they could put it up online on the class blog – how you do this is up to you. The implementation of Process Writing can take several forms. 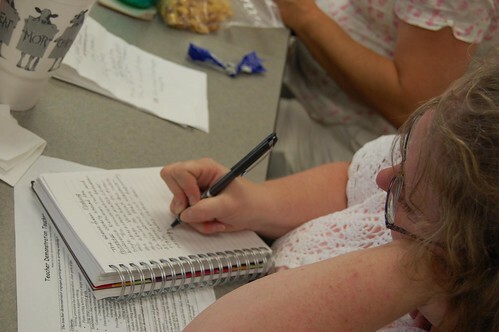 Some examples of classroom application include writers’ workshop, writing across the curriculum, the use of journals or logs, and modeled writing. If your school has a computer lab then make the most of it and have your students work on the PCs. That way work can be easily saved, edited, sent on to other students for revision, and eventually printed out. If the school does not have broadband and emailing back and forth is difficult simply have your students swap computers to review each others’ work. When planning a lesson‎ on Process Writing you can go two ways. You can either prepare a plan yourself to then pass on to your students or (depending on the age, competence level and motivation of your students) you can work on the planning stage with them. Either way, start by brainstorming and noting any ideas that come to mind. Decide which of these ideas are most relevant to the writing task. Plan the way in which the piece of work should be organised. Think of how you could start, what is going to be your main point how you would like to wrap it up, and so on. Once the writing plan is drawn, students can start writing. Make sure they are aware that the focus for the first draft will be on content rather than accuracy. Let them know that grammar and spelling mistakes – though obviously better avoided – are allowed at this stage. This is not to encourage any lax approach to grammar but simply to keep the focus on substance rather than form. During the revision stage get the students first to look at content, relevance and organization of ideas in their first draft and see if they are any major problems. For this they can pass their piece of work to others in the class. We all know how a second set of eyes can spot things we never noticed. Also, by exchanging opinions students will start to appreciate that there isn’t just one good way to organize a piece of writing and hopefully they will gain more confidence in their organizational skill. Once your students are happy with the content, get them to look at the more technical aspects of writing: grammar, vocabulary, spelling and punctuation. Here again, as in the drafting stage, it is important that students don’t feel overwhelmed by the task of achieving accuracy. Checking grammar, vocabulary, spelling and punctuation all at one time is a tall order and would put anyone off! Break the task into mini review tasks. Select a grammar item you know is often problematic for them, and likely to be recurrent in this piece of writing, and ask them to concentrate on that only. Then have them look at another targeted grammar item. And so on. Don’t worry about having three, four, even five mini reviews. By breaking it up in piece meal, manageable chunks you are helping your students to stay focused throughout and hopefully spot as many mistakes as possible. Depending on the competence level of their student, and often due to time restrictions, some teachers opt to review their students’ work themselves. We don’t advise this practice but if you feel it would be useful to your class then see our article on error correction for best ways to approach this. A final note with regards to time. Often as teachers we may be bound to a set syllabus or the school schedule, which forces us to fit everything into one lesson. Try to avoid falling into that trap! Process writing is in stages and should be taken in stages. Whenever possible you should spread out the work over a number of lessons and even set some of it for homework.